Dizocilpine is a highly selective and potent non-competitive antagonist of the N-methyl-d-aspartate (NMDA) glutamate receptor. It is well known that dizocilpine has different neuroprotective effects in animal models of pain, epilepsy and oedema during trauma. The search for alternative antiinflammatory drugs is ongoing. We investigated the anti-oedematous effects of dizocilpine and the probable mechanism of action in a rat model that mimics local and persistent inflammation without tissue injury or damage. Male Wistar rats were injected with 100 μL of 0.5% carrageenan to the plantar surface of the hind paw. Anti-oedematous activity was assessed in the carrageenan-induced paw inflammatory oedema test with a plethysmometer. To assess possible mechanisms of dizocilpine action, we examined the effects of the selective inhibitor of neuronal [N-ω-propyl-l-arginine hydrochloride (L-NPA)] and inducible [S-methylisothiourea (SMT)] nitric oxide synthase (NOS). Dizocilpine after systemic (0.0005, 0.005 and 0.02 mg/kg, subcutaneous (s.c.)), but not after local peripheral administration, reduced the paw inflammatory oedema. The effect is not dose dependent, and the highest decrease by about 47% at the time of maximally developed oedema was achieved with 0.005 mg/kg. Intraperitoneally (i.p.) administered L-NPA (0.5, 1 and 2 mg/kg) or SMT (0.005, 0.01 and 0.015 mg/kg) before dizocilpine abolished or reduced the anti-oedematous effect of dizocilpine by about 70–85%. 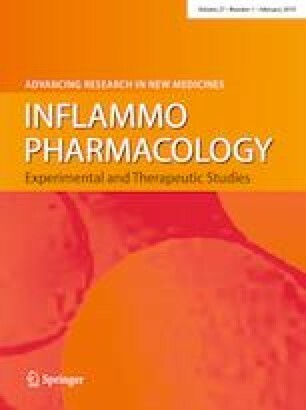 An acute single dose of dizocilpine administered before inducing oedema systemically reduced the development of inflammatory oedema. The mechanism of the anti-oedematous effect includes, at least partially, an increase in nitric oxide (NO) production. This work was supported by the Ministry of Education, Science and Technological Development of Serbia (Grant number 175023). All applicable international, national, and/or institutional guidelines for the care and use of animals were followed. All procedures performed in studies involving animals were in accordance with the ethical standards of the institution at which the studies were conducted.